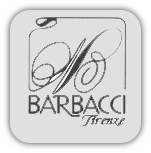 Creating innovative lines of handmade products, Barbacci was founded in 1958 in Greve, Italy, a picturesque commune in Florence. The company has imported to the US since 1992, although the brand is particularly recognized and appreciated in the finest of boutiques in Paris and all areas south of France. Few bedding manufacturers are able to match Barbacci's ability to output luxury bedding that is truly custom to order. Materials used range from simple cotton cloth to rich sateen, Fiandra, jacquard, wood (lyocell), precious linen, linen mixture, and pure silk. Sheets are enriched with embroidery, applications, lace and lace work. Borders are especially elegant. High manufacturing standards ensure the utmost in quality, from the selection of tissue to designs and cut technique - still made by "tear."